The design of every office is different. D.C. offices are given to Members by a lottery system. Every office has it’s own unique layouts and architecture, and some designs are better than others. Members choose furniture from an approved catalog but they can add a variety of other things like art to their office. Most offices like to display district related knick-knacks or tchotchkes to their office. Things that are from the district or are produced in the district are especially prevalent. One office had a magnificently HUGE picture of mountains in Nepal. Another had all their snacks in iron skillets produced by their district. I swear I saw at least nine skillets. Another office had a giant piece of coral on the front desk. SO MANY SNACKS. The snack trade is an awesome but sometimes controversial topic. Most offices have some home-state snack items available for visitors. I’ve seen M&Ms, peanut chews, Fritos, Chick-fil-a potato chips, bags of rice, granola bars, sour gummy worms, prunes, orange juice, pop-tarts, pepsi, pork rinds, peeps, and so much more. Most offices are happy to give away their snacks. I started to ask offices for a snack whenever they rejected my survey request, just a little pick-me-up for trying. As odd as it sounds, staff snack trades can also play significant roles in the offices. One intern I talked to said he did a tour for another office in exchange for M&Ms. However, his boss was upset by how little M&Ms the intern brought back, and he said they were never doing favors for the other office again. These snacks may be great perks to visitors, but they can play bigger roles for the hungry underpaid staffers. Where are all the old people? Don’t be fooled. Millennials are actually the ones running Congress. When you watch the news, most of the time you only see the Members on TV who tend to be older (the average age is 57). According to CMF, in 2001 the average age of a Senate staffer in D.C. was 31. But I personally don’t think I met anyone older than that average in the House. The staffers are young, especially LCs who position is often described as a low-level gateway to other staff roles. Functionally most offices work the front desk the same. There is usually one to two desk at the front door with people that greet you. Most of the time interns sit at this desk, answering phone calls, sorting mail, and greeting visitors. Business cards are currency. The first thing almost every office asked me for when I arrived was a business card. This is passed along to whatever staffer is I’m meeting. 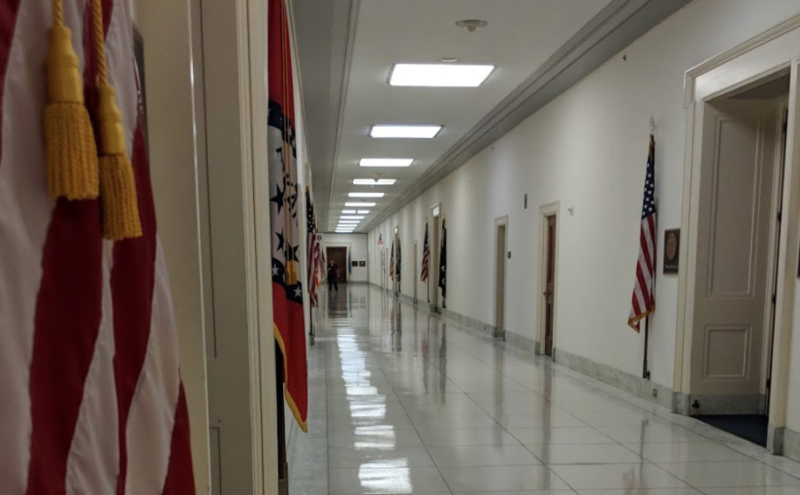 I went through about 150 cards in my first three weeks on the Hill. Interestingly, every office had similar but subtly different cards. Paper color, ink, and formatting were different for every office. Some offices even had accessible braille cards (WHICH IS AWESOME). Although a seemingly irrelevant detail, the business card diversity is another example of how many details in the House are not standardized across offices. It’s a small but costly detail. And I wouldn’t be surprised if subconsciously those small details make staffers feel less connected to other offices. Most of the time, you’ll also find the cards of every staffer available to take on the front desk. Rayburn is the worst, Canon and Longworth are better. This is just my personal opinion, but in terms of ease of navigation and aesthetics, I’m not a huge fan of the Rayburn office building. It’s very large and hard to navigate. And the stairwells always feel like an icebox. Plus it’s the farthest away from the metro, making it the farthest walk from the center of the action. Labeling Buildings from top to bottom: Library of Congress, Canon, Longworth, and Rayburn. Picture by Architect of the Capitol. If you are doing research on Congress and you plan to visit the Hill. Here are some of the things I learned. August recess is the best and worst time to visit. I had very mixed reviews on this. On the one hand, August recess is a very relaxed time. The offices are less stressed with their Members back in the district and the staff have more free time to chat. On the other hand, August recess means district visits and vacation, so there ire generally fewer people around to chat with. But overall, I find August to be a more accessible time to reach staffers. Nothing replaces in-person visits. Compared to the many other surveys I’ve seen of Congress, I found in-person visits to provide the fastest and highest participation rate, with my own survey hovering around 22-25% participation. You cannot replace face to face contact. It establishes trust and comfort in a way phone calls or online surveys cannot. It also helps with clarity in asking your questions. Congress is a bunch of people. External surveys that limit in-person engagement with Congress miss crucial details that you get when you see the real people working behind the desk. I’m the first to admit that in the past the media has played a huge role in my perceptions of Congress. I even had to stop watching Veep because I was afraid of it affecting subconscious biases. But once you visit, you realize that staff in Congress are like everyone else, good people (for the most part) that are just trying to do their job and serve their country. The number of lovely hardworking folks vastly outnumbers the bad. Mornings are best. I found people were more awake in the mornings and much happier to sit and chat. I have no evidence to back this up, it was just my own perception. But beware, most staffers are a little late on recess so don’t plan on them coming in until 10:30. Staff may also only work half days, especially on Fridays during recess. Connections matter. Collaborating with groups like CMF and Open Gov was invaluable. Not only does their support allow me to share my data with more groups working on the same issues, but it also gives my own research credibility in the House. CMF and Open Gov are trusted names because they work directly with the House to train staff and improve their technology. They also provide amazing expertise on how to best approach staffers. Avoid the word ‘survey’. Many offices have a no survey policy. Because I was working with CMF, who often trains staffers, some offices made exceptions to the rules. But be advised that some offices will not participate in any external studies, especially without a direct benefit to their office. Keep up to date on current scandals. Although I will defend most offices and staff, there are of course some offices that are under fire for various scandals in the news. Don’t expect those offices to be cordial, even if you want to chat with them about a completely unrelated topic. Staff will be on the defense of anyone trying to get their office to get more details about a potential scandal. I ran into this once where I didn’t realize an office was under fire until after I got a very rude denial from an office. CMF had to explain to me later why they didn’t participate. Bring walking shoes. I walked an average of 5-6 miles a day visiting offices (this includes my walk to and from Eastern Market). In my first week, I made the mistake of trying to wear nice shoes to look professional and I ended up with a stress fracture in my heal. The floors are hard and unforgiving marble. Get super comfy and supportive insoles. Also during recess, people are walking around in nice shirts and jeans, so don’t be afraid to be more relaxed. Staffers are harder to engage inside the office. I think this is naturally one of the hardest parts about getting rich survey responses on the Hill. It’s hard for staff to think about Congress critically when they are being watched by their colleagues. Many are reluctant to give personal opinions in that space. So although they are easier to reach, if you want staffers to express their opinions more than stating facts, getting them outside the Hill may be better. That’s everything I can think of at this point. I may update this list if I find anything else important. But for the most part, this is what I saw. Cheers! Previous Previous post: The Problem With Constituent Correspondence. Is Technology to Blame?